Berkeley, CA â€“ 31 October 2011—This January, Ted McKeever will be introducing the world to MONDO, his new three issue miniseries from Shadowline and Image Comics, in all its raging glory! Though McKeever has worked on titles for Marvel and DC, including Spiderman and Doom Patrol, he is best known for his independent, creator-owned works such as TRANSIT, EDDY CURRENT, METROPOL, and the recent META 4. McKeever has been a cult favorite in the comics industry since the 1980’s, an uncompromising one man comics team, consistently creating smart and uniquely twisted comics with a gritty, subliminal quality to their black and white inked pages. His work is often executed in mixed media, creating layers as rich and dirty as the stories themselves, and McKeever’s new MONDO will be no different. MONDO begins with Catfish’s daily grind of “enhancing” poultry, but all that comes to a halt when he is accidentally tripped up by a loose chicken, causing him to fall victim to his own process. What proportions of his that were once human are now beyond anything normal! Add villainous corporate and military big wigs, a roller-skating weapon-toting chick named Kitten Kaboodle, a gang of tattooed babies, an enormous beach monster… and you have Ted McKeever’s MONDO! 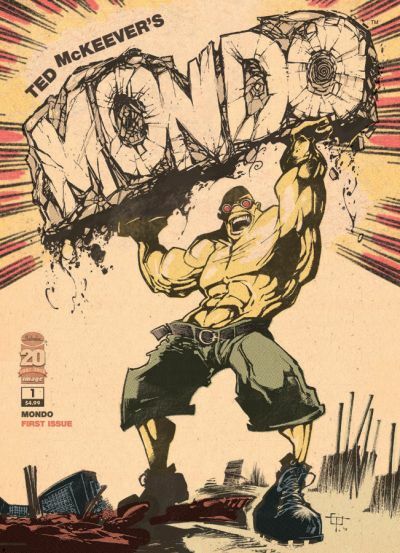 MONDO #1 (NOV110366), a 32-page Golden Age format black and white comic book for $3.99, will be on sale in stores and digital platforms on January 4, and is available for order now in the November issue of Previews.